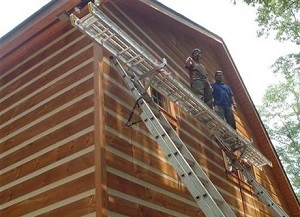 Cashiers log home restoration is used to remove mildew, grayed out wood fibers and oil based stains and sealers. With proper dilution the solution used can be applied to the wood preferably by spraying but also can be brushed on. It is very important to note that proper safety measures be taken when using this method and all instructions should be closely followed. Never mix water into Sodium Hydroxide. Instead, always mix the chemical into the water slowly and carefully. Mixing water to the chemical first causes a reaction that produces an enormous amount of heat and fumes. Safety goggles and gloves are mandatory as well as other protective clothing. Also, this chemical will kill grass and plants as well as stain glass, siding and other surfaces. If you are not sure about how to use this product, it is strongly recommended to find a Cashiers deck restoration professional who does. This is nothing to play with. If you're looking for a professional deck cleaning contractor in Cashiers, then give us a call 252-266-9457 or complete our online request form.